Very sharp waterfront home on all sports Little Long Lake with many updated done, newer 5" well, wall furnace, part of the roof, & updated survey done. Home has vinyl siding, large open living area, living room with vaulted ceiling, ceiling fan, gas stove, and 3 patio doors onto large 15x30 front deck, & plenty of room for additional sleeping, lots of knotty pine, utility room with stackable washer & dryer, full bath, built in air conditioner, nat. gas, city sewer, nicely landscaped with sidewalks and patio, paved road, on a nice lot with 66' of sandy beach. MUST SEE! Being sold mostly furnished, move in and start enjoying. 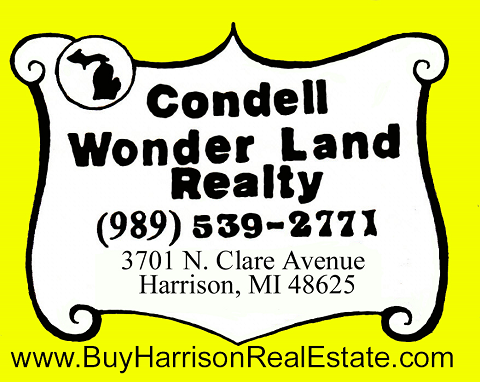 Lot 16 land of Lakes Add Supervisors Plat of City of Harrison, Clare Co. MI.